You absolutely 100% have to be kidding me. 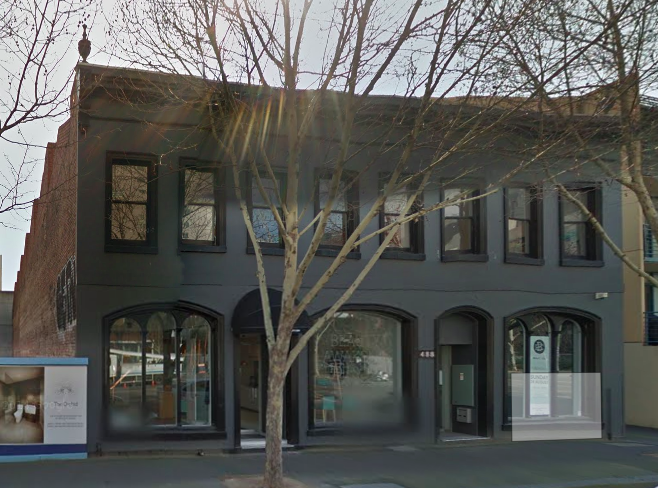 We're going to knock over yet another of Melbourne fine Victorian heritage buildings for this pathetic design? Please. Melbourne needs to wake up to the value of its built heritage assets - and fast. Why can't the facade, including the rare and original Victorian timber shopfronts and a bit of setback be incorporated here? 36-40 La Trobe has just been demolished - now this? Why did City of Melbourne not list it in the CBD heritage review??? It is located within the area that was reviewed in the City Heritage Review. If heritage reviews picked up everything of significance, then we would never have to do gap studies, and amendment C186 and the City North Heritage Review would have been unnecessary. This one was indeed 'missed' this time around - but that doesn't mean it's not historic and not worth protecting. How many Victorian buildings are left in this stretch of La Trobe Street? Saving this building certainly has merit, but I must stress that a lot of buildings that come under protection do not deserve too. Not everything that is old is good. Should have posted a pic of the ground floor mark. Another example of building standards killing streetscapes..the frontage is about 1/3rd electricity substation for building, 1/3 carpark entry, 1/6th residential foyer and 1/6th fire hydrant and other fire safety requirements. I.e. 0% active frontage. No its was only the CCZ, which stops at south side of latrobe, but does include market area, bounded by william, peel, victoria, swanston. they should just delete those three apartments at the back that will have bugger all amenity at the base of the 30 foot tower and push stuff deeper into that space eg. all the stores shifted back into that space. the visitor bike parking shifted to the bottom of page 'stores' area then the area that is the visitor bike parking and stores could have been the substation and gas meter room still accessible from the internal driveway... the substation footprint could then have been a retail space. This has been rejected by VCAT. Do you know why Qantas ? Could it possibly be windows built on the rear boundary and two tiny looking apts on the east side with only windows being in a re-entrant 2m wide setback ? Glad to see that being flanked by strata titled properties is not being taken as definite protection from future high-rise - i do think that with such property values, the low rise places like Royal Flagstaff Latrobe st side could easily be bought up and built up. We conclude that the proposed building is not an acceptable design response to it physical and policy setting due to its overall height, massing and lack of side or rear setbacks. We consider these are inconsistent with its existing and preferred character setting. We do not seek to determine what an appropriate response is for this site as this is not our role. However, based on our concerns about visual bulk and direct amenity impacts we note that even if the height of the building was significantly reduced (even below 40 metres) it would not resolve our concerns about the direct building interface on boundary to the north and east or concerns with internal amenity. In other words, the design was rubbish and even though it's not their job to comment on it, they did. This raises the question though, if it's not their job to comment on the design, who does? This was obviously mediocre at best with huge blank brown walls - even the render was terrible. No wonder so much mediocrity gets through and built, including CE and Brady projects. Surely aesthetics should count when considering a large proposal? Ummm ... well in the meantime the building on site has acquired an interim heritage overlay under the West Melbourne heritage review. So seeing as this seems to propose complete demolition of that, Hayball might care to try again?? There is literally no way this is happening. Hayball were also forced to back down on full demolition of the Macrobertson's Garage building for their "Lyric" project in Fitzroy after it was found to be of heritage significance. As you say, Adam - try again. More retail street frontage now, better than that junk frontage. By "junk frontage" I gather you mean "rather fine 1905 late Victorian-era warehouse building"?? Well the "junk frontage" has a heritage overlay on it now. So why are they even shopping these designs around?? That building can no longer be built in this form. Full stop. But yep. Wthat that stretch of La Trobe is crying out for is more RETAIL activation and LESS heritage, especially given what a retail destination that block has already become. Was actually referring to the terrible street frontage of the original proposal (as pointed out by JohnProctor) not the heritage facade. Fair enough, Not sure where the idea comes from that this has "good frontage" though?? Look at the street level diagram. That's a DRIVEWAY RAMP occupying about a third of it along La Trobe. And why are we seeing these unbuildable images NOW? Has nobody informed the owner about their heritage overlay? This is obviously a response to VCAT, but obviously not a response to the new heritage context. Pretending the overlay doesn't exist won't win you approval any quicker. Or at all. Strange. This will probably get flipped anyway. There is still no heritage overlay over this property.